If you are like me – beginning with programming in Objective-C in Xcode and you were Java programmer previously, you will wonder how to write code comments in a similar way to JavaDoc. Well, Apple obviously thinks that programmers do not need to write documentation. Otherwise they would implement a similar documentation tool such as Javadoc and do not force programmers to do nasty hacks to be able to do so. However there is a way, even though it requires a few manual steps. This blog post is a step-by-step how-to guide to prepare your Mac OS X 10.7 and Xcode 4.3 to be able to generate documentation out of your code and let Xcode offer that documentation to you through its Organiser and also through Quick Help in Utilities area. We will need to build the Appledoc application as there is no official OS X package available. After having the binary builded we will need to distribute the binary and also a couple of templates required to build HTML documentation files into our system. Walk through Gentle Bytes website. We will use this free tool (BSD license) to generate documentation out of our source files. Syntax of the code comments is described on Gentle Bytes comments page. This command will create appledoc directory and clone the project’s GIT repo there. Open the appledoc.xcodeproj file in Xcode. Edit your Scheme by clicking Xcode menu > Product > Edit Scheme menu item (Cmd + <) and change the Build Configuration to Release. Build the project to get an executable binary. Let Xcode open the location of built appledoc executable. You can also find the location manually, just search in ~/Library/Developer/Xcode/DerivedData/ for appledoc directory with some randomly-generated suffix. 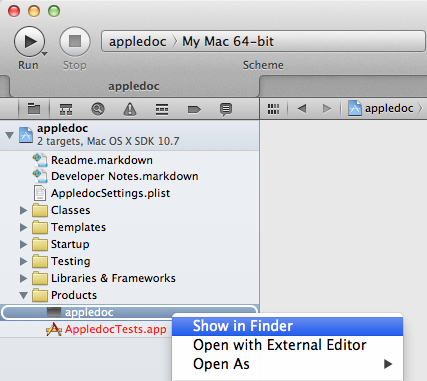 Copy the appledoc executable into the /Applications directory. 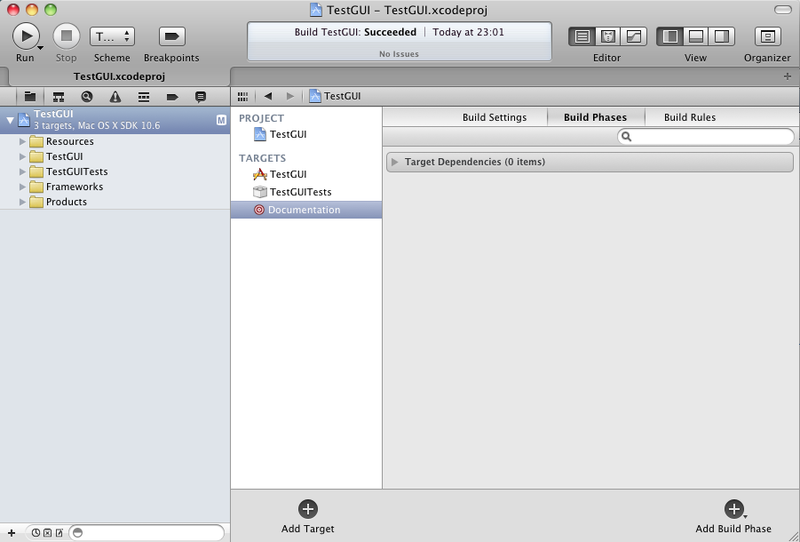 Having the executable in the /Applications directory will allow Xcode to run the tool as a build script. Appledoc application requires a couple of templates to be able to generate Xcode documentation. Goto the appledoc directory (the one created by GIT in previous step) and copy the content of Templates sub-directory into ~/Library/Application Support/appledoc/. This is the default location the application searches for its templates in. To ease our life we will configure our Xcode projects so that when we build our applications the documentation will be generated automatically as well as Xcode will be informed that the documentation was updated. Add this configuration file into your Xcode project directory and name it AppledocSettings.plist. Do not forget to change the red-marked options according to your needs. You can also play with the other options as well. More information can be found on the Gentle Bytes settings page. <!DOCTYPE plist PUBLIC "-//Apple//DTD PLIST 1.0//EN"
Add a new target into your Xcode project (Mac OS X/Other/Aggregate target) and name it Documentation. The new target will allow us to get the documentation generated every time we build our projects. Add Run Script build phase into the Documentation target. The Run Script will give us a chance to enter shell script to run the Appledoc application and pass commands over to it. Add the shell script below into the Run Script shell command place. Add Documentation target into the existing scheme so that the documentation is created every time you build your project. You can reach the screen below by clicking Xcode menu > Product > Edit Scheme menu item (Cmd + <). Every time you will build your project the documentation will be generated automatically and will be pushed to Xcode so you can start using your documentation immediately. The only issue with Xcode 4 is it does not reload Quick Help cache upon documentation changes. The only way to get it reloaded is to restart Xcode. 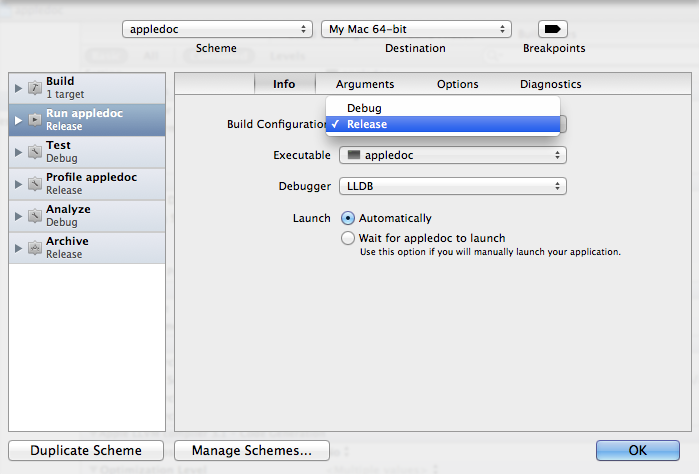 In Xcode 3, it was possible to reload the documentation by running an AppleScript command below. However, it does not work in Xcode 4 anymore. If you are interested to see the output documentation files the Appledoc tool creates, go to the directory below. 54 responses to this post. I think AppledocSettings.plist is broken. Could you fix this one, please? Thanks Dmitrij for your comment. The XML is corrected now. I have no idea what that problem means. Sounds to me the like a bug in Appledoc implementation. Hey, I’m the person behind appledoc, just came accross this post searching for custom build targets 🙂 I find it nice introduction to appledoc and will add it to home page along other external links. Thanks! BTW The incompatibility error described above is due to using NSRegularExpression which are 10.7 only. These were introduced with recent contribution that allows better headerdoc integration. It should be fixed by now, update to latest version. The downside is the feature is disabled for 10.6. ERROR: AppledocException: –project-name argument or global setting is required! but, I have those variables set in AppledocSettings.plist. Any idea what causes this error? I have just fixed it. Thanks for posting the solution! By specifying the Xcode-specific log format, Xcode can show the warnings and errors it discovers when building the documentation in the issue navigator. You can also add that to the AppledocSettings.plist, but I prefer to leave it out so manual command line builds don’t use that style. Well, thanks for your comment! It is great to get Xcode showing build issues. Will try this out as soon as I have a chance. Thanks again. Following the directions given here, I can get the documentation to show up in the xcode doc browser, but I can’t get it to show anything in the xcode quick help window, which is really annoying. Should I document in a special way to get the information to the quick help window? I notice that apple content has an “abstraction” field in the quick help window, where most of the text is displayed. I have update the blog so that the links to Gentle Bytes sites work again. Still, copying your example doesn’t show anything in the quick help window. Let me get back to you. I need to do some research on that. In the latest Xcode version 4.3 it really does not work. The documentation gets generated, though. Xcode just does not display it. Yeah, that’s my understanding as well. I can see it in the documentation browser (is that what it’s called? ), but the real (well, the only, actually) reason for me to install and use appledoc (short term, anyway) is to see my documentation in the quick help window. Thanks for the help so far. No rush, I have plenty of other stuff to attend to meanwhile. Why is your usage of appledoc just a short term matter? It wasn’t my intention to belittle appledoc in any way. I’ve been using the quick help window a lot to see the contents of structs and such, and it annoyed me that I had to shuffle through my files to read the documentation on my own code. I’d rather shuffle through the code than wade through the documentation organizer (thanks), so I really just need the quick help window functionality. For now, that is. I’ve always documented and I still do, so it’s not a matter of getting things documented. It’s just a matter of getting the documentation to show when I need it. Your question for the google groups words my problem nicely, btw. Oh, and it turns out that I’m a lousy blog user. I keep forgetting to press reply to the post I’m answering, instead of just using the box at the bottom. into your AppledocSettings.plist. Xcode 4.3 seems to check this against the platform your code is being developed for. Also, I have updated the blog. No problemo 🙂 Let’s see if the autor replies. I’ve been using Quick Help a lot as well so it’s a pity it does not work anymore. After succesfully build of my project, i donot see any documentation any where on my macbook 😦 . I have set company id as com.amathon. I have “/Users/macbook/Library/Developer/Shared/Documentation/DocSets” but there is no filder com.amathon.docs . 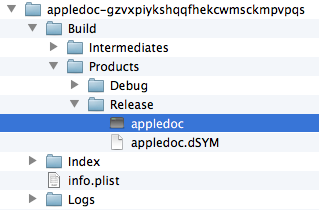 The result of runnin appledoc in your Xcode project is the docset in the folder you mention in your post. It this was not created, then the build had to fail. Did you get any error messages? I have not got build errors, and my project got successfully build. I have added new aggregate target as ‘Documentation’ and in Documentation shell command i have written “/Applications/appledoc /GIT-Projects/myProject/AppledocSettings.plist /Developer4” . my appledoc executable file is in /usr/bin and also in Applications folder. Try to run this command in commandline to see what happens. If everything goes well, there is no output but “appledoc version: 2.0.5 (build 789)”. After running the command above you shall have the docset in your ~/Library/Developer/Shared/Documentation/DocSets/ folder. I have successfully generated appledocs in xcode 4.2, but i was unable to refresh documentation again. Xcode still show old documentation. I have read from different form to run tell application “xcode” action script but i donot know where i have to place that action script? Do i need to place it just below the “/Applications/appledoc $SOURCE_ROOT/$PROJECT_NAME” ?? The script works in XCode 3 only. It does not work in version 4 anymore. In order to refresh the documentation after it is built you have to restart Xcode. I have restart Xcode even 2,3 times. Actually i have generated documentation with 50 classes in it. Documentation generated very fine. Now i have removed some unused classes and now my classes are 45 in number. 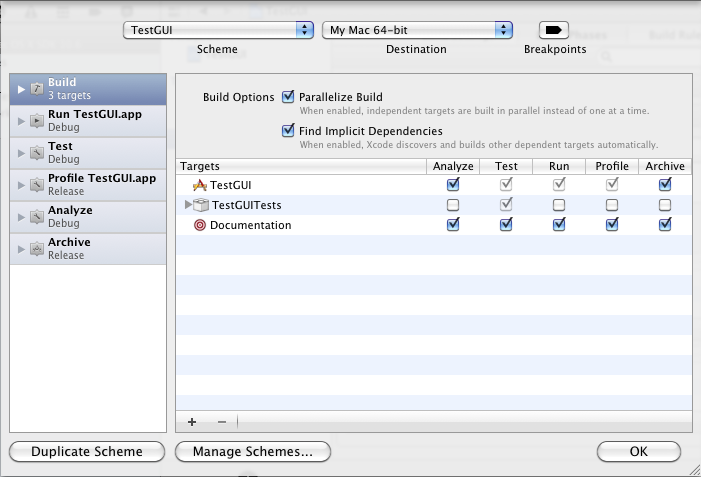 Now when i generate documentation then old 5 classes documentation still shows in Xcode 4.2 > Orginizer > Documentation tab. I want to remove old documentation of that 5 classes. Sounds to me as a bug in appledoc software. It looks like it does not remove the old files prior generation of the new docset. You are welcome, always glad to help. I owe you a beer! Thank you! Does this work for iPhone projects? I have not tested appledoc on iPhone projects. But I think it should work with no issues. It is just a different Xcode project with ObjC code. Thanks for this great post! One quick question, I set –create-html to be ‘YES’ in the AppledocSettings.plist, but cannot locate the html output. Could you please advise? You will find the HTML code in this folder: ~/Library/Developer/Shared/Documentation/DocSets/com.yourCompanySite.YourProjectName/Contents/Resources/Documents/ . By the way, –create-html option is set to true by default. You do not need to set it explicitly. It is useful if you want to check your appledoc settings. If you invoke appledoc with –no-create-html, appledoc will validate your settings without generating the HTML output. It is just a time saver – HTML generation takes about 90% of the whole processing time. Firstly, I have no idea which path do you mean. Do you talk about the location where this tool generates the documentation files? I see. Let me get into that and come back during this weekend. I am currently snowed under my work issues. 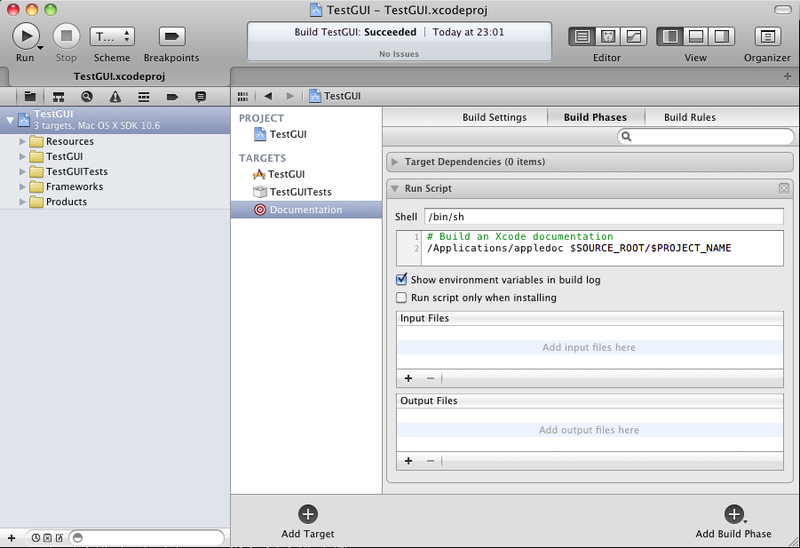 Just built the latest appledoc version from GIT and tried it in Xcode 4.6. It works perfectly. What error message do you get? You need to be more specific so I am able to help. Thank you for posting this. This is very helpful. By the way, for those who encountered a problem below, I might have something to help. This problem has something to do with where your AppledocSettings.plist is located and its filename which is case-sensitive. In RunScript -> /Applications/appledoc “$SOURCE_ROOT/$PROJECT_NAME”, it assumes that your AppledocSettings.plist is located within the folder with the name same with your Project Name. Thank you again for this wonderful post. And thanks for posting your findings about the plist file! This post is extremely useful. Thank you for taking the time to put everything together. I have a quick question. Appledoc only documents files located in the same directory as AppledocSettings.plist and its subdirectories. How can I document files located in a different folder? Is there any setting where I can include something like “../MyNewFolder”? As per my understanding, the AppledocSessings.plist specifies global options for your project so that you do not have to pass tons of command line arguments to the appledoc script. Once having the options file in place, just call appledoc and pass it list of paths you want to generate documentation for. I.e. update your Run Script command in the Documentation target and Bob’s your uncle.